Model binding things other than textboxes could be tricky in ASP.NET MVC. To correctly model bind, one has to follow a specific naming/value conventions in the HTML. 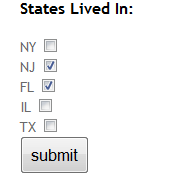 Let’s say we have a model object called People, and we have a List of states people have lived in.